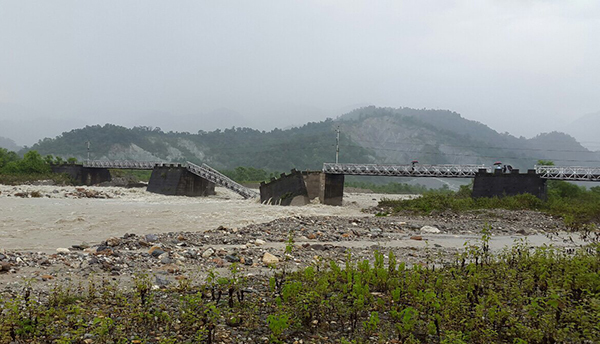 At 7 this morning, a bailey bridge in Samtse collapsed after one of its abutments gave way. No casualty has been reported. The Budhini Bridge, which is located about 3.5 kilometres away from Samtse town, connects Samtse Dzongkhag Administration with nine other gewogs, mostly under Tashichhoeling Dungkhag. 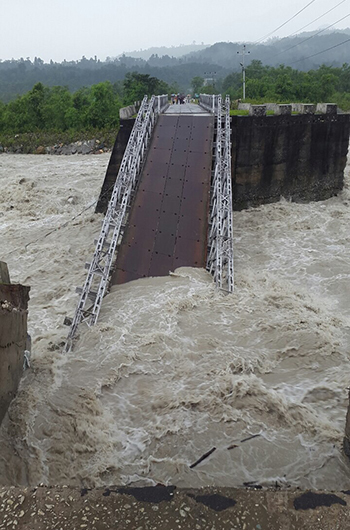 The initial cause, as reported by the officials, could be due to swelling river after the dzongkhag experienced heavy rainfall for the last one week and it continues to. According to Department of Roads officials in Samtse, they will try to divert the course and make a temporary bridge over Budhini River. But, they are not sure how long it would take as volume of river keeps increasing because of incessant rain.